The “Vortex” space opera has its roots in “The Zarkonian Bomb,” a film script that I wrote with Carlo R., Jon and Bill B., and Ray C. in high school in New York's Westchester County. 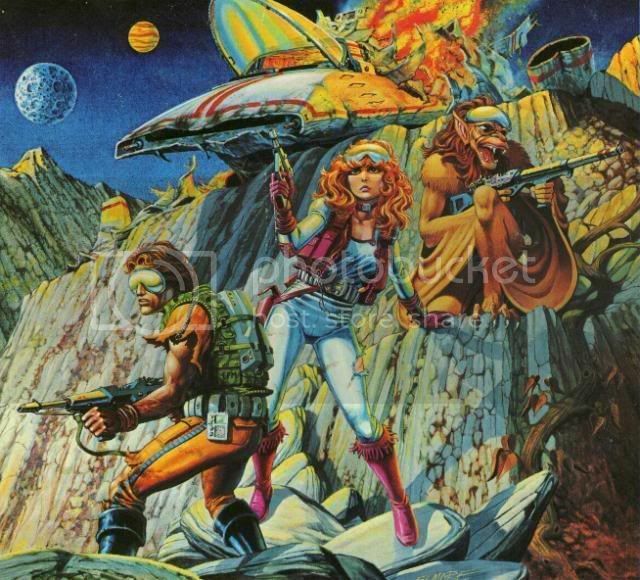 Looking back to 1982, we were obviously inspired by the novels of Isaac Asimov, Doctor Who, the original Star Wars film trilogy, and the Star Frontiers game. I later wrote “The Adventures of Jason Delmar,” a series of short stories. In contrast to “hard” science fiction or other subgenres like cyberpunk, space opera features relatively easy interstellar travel and human interaction with aliens, plus themes of exploration, diplomacy and heroism amid warfare, and the importance of friendship. Space opera has its roots in the “planetary romances” of the 19th and early 20th centuries, pulp fiction, and movie serials, but James Cameron's Avatar is a recent (if explicitly derivative) example. In college in Upstate New York, I created the “Vortex” role-playing rules with my brother Peter and David I.S., influenced by Advanced Dungeons & Dragons 2nd Ed., the Star Trek franchise, books by Larry Niven and others, and the cyberpunk/fantasy game Shadowrun. Our system had several species options, five attributes (Prowess, Agility, Intellect, Respect, and Aura), skills and mystical powers, and lots of gear. The name “Vortex” came from late-night conversations about the nature of time, human history, and perception with Carlo and Dave, touching on the works of Edward Gibbon and Mircea Eliade. Is history linear or cyclical? Are technological and social progress inevitable or transient, and what role does individual choice play? From the perspective of the present, global events seem more crowded at an ever-accelerating pace, hence the vortex (I'm not the only gamer to think of it this way). It can also represent the spiral of the Milky Way Galaxy. After graduate school, I used the Generic Universal Role-Playing System to run successful campaigns, including GURPS 3rd Ed. Space: “Vortex,” for about a dozen people in Virginia in the 1990s. At that time, we enjoyed the books of three Davids (Brin, Gerrold, and Weber), movies like The Fifth Element, and television shows such as Babylon 5 and Space: Above and Beyond. The universe expanded as the players developed more aliens, and the crew of the P.T.S. “Venture” explored more space. Earlier in the 1990s, I had used the original “Vortex” system for “Bay City: Visor and the Seer,” which later became the GURPS “Supers: the S.J.I.” superhero campaign (most recently using D20 Mutants & Masterminds 2nd Ed.). In addition, we used my timeline in the “Voyagers II: Adventures in the Dimensional Corps” game I co-ran with Steve M.R., Tim M.B., Jim J.D'B., and other Game Masters. I ran GURPS “Vortex” briefly by e-mail and for Rob R. and Randy K.M. after moving to the Boston area. We then returned to my long-running “Vanished Lands” fantasy campaign using Dungeons & Dragons Third and Fourth Editions. In 2010, I expect to incorporate some “transhumanist” concepts, “retrofuturist” speculative fiction, and “rules-light” games, looking back and ahead simultaneously. In future posts, I'll explain more of the “Vortex” setting, character options, and various space opera rules sets. Feel free to post your own questions and ideas to the “Vanished Lands” Yahoo/eGroup, the “Holy Steel” Google group, or my blog at Yahoo, MySpace, EnWorld.org, or Wizards of the Coast! Posted on May 6, 2010 by GeneD5Posted in Games, Speculative Fiction, VortexTagged RPGs, space opera, Vortex.